"Pa," asked Josh, "What is Music?" "It is an Art. The word is said to derive from Greek μουσική (mousike)," answered Rosh, "which literally means Art of the Muses." "Music has always existed. For as long as sound has existed. The Divje Babe flute, carved from a cave bear femur, is thought to be at least 40,000 years old." "Did you know Gandharv, frequently mentioned in ancient Sanskrit texts, were a community of artists who sang and danced to entertain the gods." "Music exists in everything. It is all around you. If you have the ears, you can feel it in the rustle of leaves, the roar of storms, the crackling of twigs or the buzz of bees." "Hindu thought conceives Pure Music as Anaahat Naad - unstruck sound. As Music can find expression in the silence of wisdom, in the beauty of a flower, in a lover's eye, or in a baby's cry." "Music is food for our Souls, the song of our Beings. It transcends civilizations. It transcends borders. It is uninhibited by race or colour, unbounded by creed or religion." "Music exists in the metronome of a heartbeat, in the cacophony of a funeral pyre, in the lapping of gentle seas as well as in the marching drums of war." "Music can ignite desire when the Hula girls gyrate or incite renunciation when the Turkish Dervishes whirl. Krishn's flute can excite humanity into Raas (passion) and Hitler's wardrums propel it into Traas (pain)." "Music is powerful. It has the power to soothe or excite, inspire or relax, stimulate or depress. It can intoxicate and lift your spirits or crush your Soul and make you cry." "With great power, comes great responsibility. The ancient Vedic schools understood this, as they used Music to accelerate learning as well as hand down knowledge." "If you didn't know the language, you were blocked out of the verbal communication. The sounds of music however, needed no language. They tapped directly into our energy cores." "The first text of Ṛg Ved, ancient scripture of the Hindu tradition, is said to have been written over 3,500 years ago. But the rhythm in Vedas and the tradition of oral teaching and transmission helped preserve the sanctity of knowledge Vedas contained, long before that." "Rigorous chanting carried the Vedic message encapsulated and uncorroded across successive generations that knew neither of paper, nor ink and who certainly had no printing presses or photocopiers." "Development of Sanskrit from ancient Brahmi and Pali scripts helped too, because Sanskrit is a very phonetic and grammatically consistent language." "Isn't it marvelous that humanity memorized the words of epic songs so easily and accurately, yet modern youngsters have trouble trying to remember even short passages of prose for exam." "Isn't it marvelous that musicians can play songs in a foreign language without understanding a word of their composition, with such poignancy that it rips through the listener's heart." "No wonder we love music. We live it. We yearn to create it. We build schools and train musicians. We teach Sargam and test compositions." "The Rigved talks of music as a Marg (meaning Path). It binds us together like a thread that binds the pearls of a necklace. 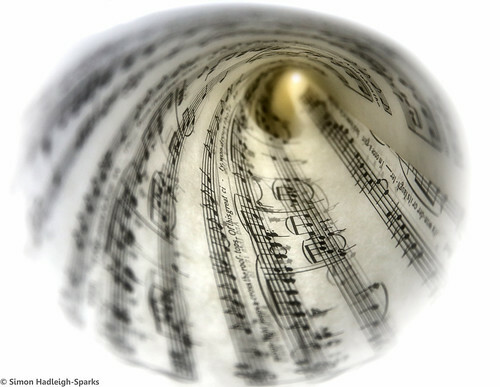 Music synthesizes the fabric of society and takes us higher, to make us realize that we are but a coherent whole." "In that sense, it is an instrument of Yog, an assimilator, a harbinger of bliss (Anand). You don't need to understand the lyrics of Nusrat or Jagjit to be touched by them." "Not everybody understands Mozart or Bach, or enjoys Michael Jackson or the Beatles, Justin Beeber or Psy, yet the music they create continues to fashion our society." "Their legacy will continue to endure, because Music soothes. Music heals. For centuries, healers have used Music therapy in all of its facets—physical, emotional, mental, social, aesthetic, and spiritual." "One of the earliest mentions of music therapy was in Al-Farabi's (c. 872 – 950) work Meanings of the Intellect, which described the therapeutic effects of music on the soul. Mental illnesses were claimed to have been treated for centuries with music in the Ottoman Empire." "Though humans have always subconsciously known and felt the healing power of music, science is only just discovering its therapeutic uses." "Music therapy is now used on people of all ages and in a variety of conditions. It is treating psychiatric disorders, medical problems, physical handicaps, sensory impairments, developmental disabilities, substance abuse, communication disorders, interpersonal problems, and even aging." "It is also being used to improve learning, build self-esteem, reduce stress, support physical exercise, and facilitate a host of other health-related activities." Next: How To Create Music?